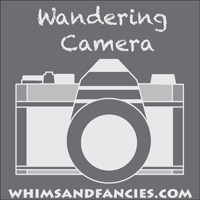 Today is my day for the Words to Live By Blog Hop. 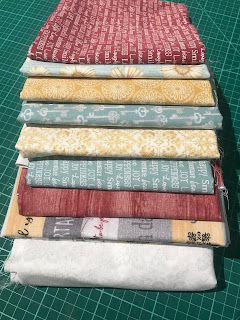 I hope you have visited the other participants and have entered at each stop to win a fat quarter bundle of this GREAT new fabric by Cherry Guidry and Benartex Fabrics. I have loved Cherry's patterns and am so impressed with her fabric designs. It's so nice to see someone venture out and become so successful in this creative world. From the moment I received these fabrics, I was smitten. The colors are so soft and peaceful and who can resist the fabulous designs? The keys....the daisies....the wood grains and the texts - each wonderful. These were the fabrics that I selected to use for my project. I knew I wanted a pattern to show off these fabrics so I resorted to the Disappearing Hourglass that Jenny shows us on the Missouri Star Quilt tutorial. Without a design wall, the floor becomes the spot for my layout. Of course, as soon as I put anything down there, my sewing companion needs to check it out. I think he approves! I always love seeing the quilts draped over the quilting frame early in the morning. The filtered sun coming through the windows really makes the quilting design pop. All finished and ready for its photo shoot. Can you STILL spot my quilt inspector? 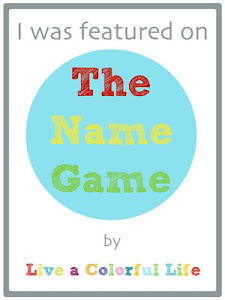 It's definitely a hit in his book. I also LOVE the way this turned out. It's such a calming quilt to me. Thank you Cherry, Lisa and Benartex for giving me a chance to play with this amazing fabric line. Benartex is going to give one of my U.S. readers a fat quarter bundle of some of these fun fabrics. Just leave me a comment and tell me which one in the line of fabrics is your favorite. You can see the full line HERE. I will draw a winner on September 19th. I love everything about that quilt....the fabrics, design, color. 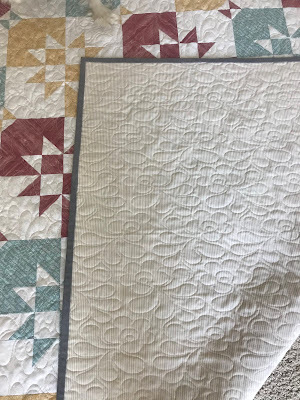 Oh my, your Disappearing Hourglass quilt is a vision splendid, Mary! The fabrics you have chosen evoke a sense of calmness and peacefulness; love the colour choices. How beautiful it looks displayed on the bed. Your quilt inspector is so very cute and of course an excellent judge of beautiful quilts. Such a beautiful quilt! I love the colors. The whole line from Benartex is beautiful, particularly the panels. I love all the panels, Words to Live By. I love your quilt, so homey. I agree with you inspector - the quilt is gorgeous! I love all the turquoise fabrics: lace, wood, and especially tiny words. Disappearing Hourglass was a perfect choice to show off these fabrics! It is a beauty for sure! I love the Tiny Words in Grey fabric...all of my favorite words to share you care for someone! It's hard to pick a favorite, but I really like the Trellis prints. Love your quilt. You do beautiful work. This collection of fabrics are so pretty. I really like the washed wood red fabric though. Thanks for the opportunity to view your creativity and a chance to win this beautiful line of fabrics. Your disappearing Hourglass Quilt is so comfy cozy looking, just looks perfect for cuddling. Those fabrics are lovely. Disappearing hourglass was the perfect choice for these fabrics and your quilt came out beautifully! I love this fabric line and would have to pick either the word stripes with turquoise or the wood grain turquoise. I Looooove the ENTIRE Collection!!! But the "Happiness" panel is my very Favorite!! :) Your quilt is AWESOME!!! & your lil' "Inspector" is Adorable!! 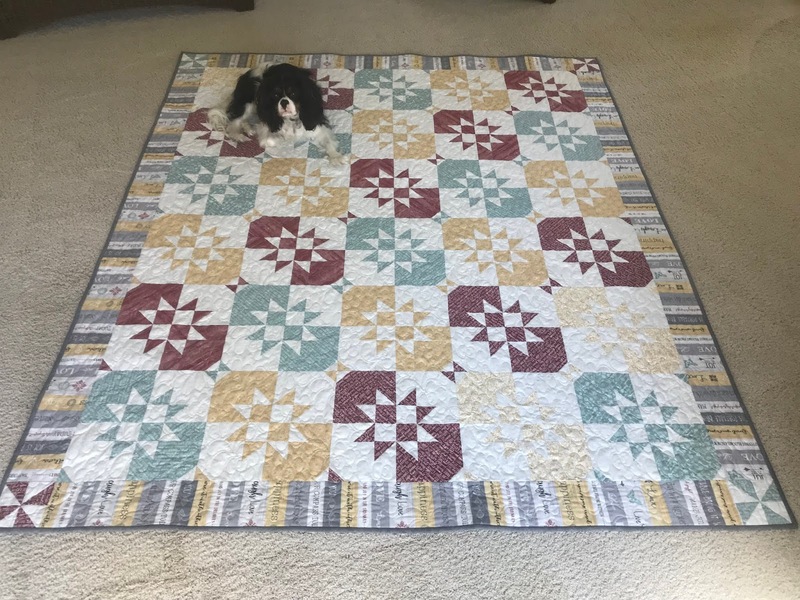 Gorgeous quilt, and the quilt inspector is adorable! I hope to make a Disappearing Hourglass quilt soon. My favorite fabric in this line is Word Stripe in Gray Turquoise. I'm torn between Happy Medallion in turquoise or Little Words in red. Love your quilt! I've been considering which pattern to make, for a friend's quilt, and this pattern was in the running. Seeing your quilt has convinced me that this is the one. I'll say that TINY WORDS GREY is my favorite, but those daisy prints are awfully cute too! Love your quilt, it shows the fabrics so nicely and the quilting is fabulous! You chose a great pattern for those beautiful fabrics! 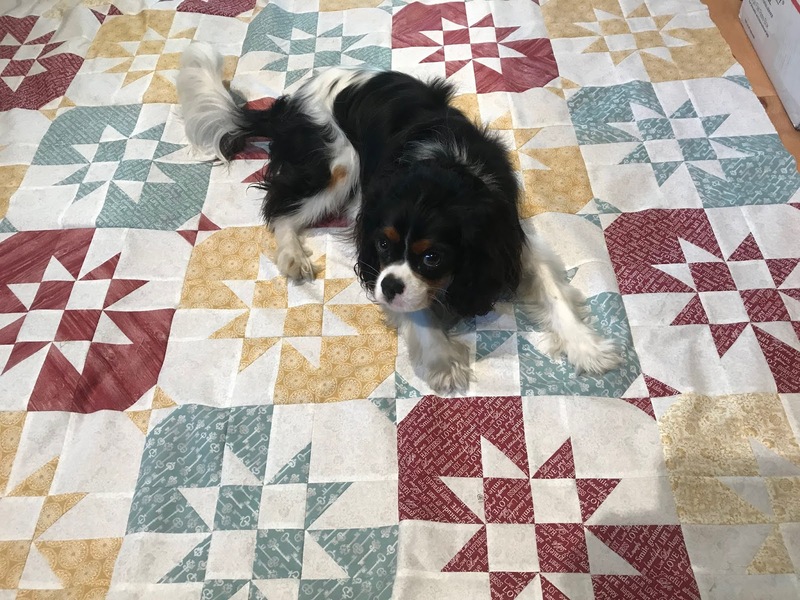 Your quilt model is exceptionally cute! The Joy panel is the fabric I choose. Your quilt really shows off the fabrics so well. Your quilt is definitely calming and gorgeous!!! My favourite is Happy Medallion turquoise. Love the quilt. And I've been in love with the fabric since I first saw it. I feel the strong pull to say Joy is fav ;o) however I really like them all. You've made such a lovely quilt with these beautiful fabrics. 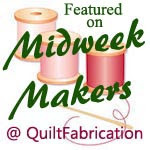 I'm so grateful for all the sharing quilters who provide inspiration. Thank you. I particularly like the "keys" fabric from the line. And the 'Joy' panel was a favorite too. I have a quilt inspector too. She is helping me read email this AM. Lovely quilt Mary. Although I am not eligible for a giveaway I just wanted to say it is beautiful. I have made that pattern a couple of times, but I think the fabrics you chose give it a lovely soft look. I love the entire line but am especially drawn to the "Tiny Words" in red. And I really like your quilt; it's perfect for the fabrics. I love your quilt! Your quilt inspector is pretty cute too! I like this whole line, but I think I like the Tiny Words in Red the most. Your quilt is gorgeous Mary. I really love the "Happiness" panel, but I also love all the turquoise fabrics. Thank you for the giveaway. I like the Happy Medallion in yellow. Word fabric is always a favorite of mine. Such a nice group here. I love all the fabrics in this collection especially the Happiness Panel. Your little quilt inspector is absolutely adorable, and that quilt is gorgeous. I love all the soft muted colors in this line, especially the blue and gold. 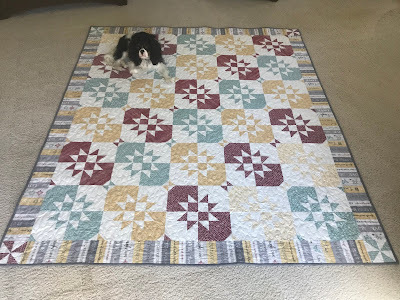 What a lovely quilt and fun post!! I like Keys Turquoise. Your quilt is beautiful and it looks like it's a good size. My favorite is the Keys Charcoal print. Love your quilt! I am going to have to try that pattern! Oh, beautiful quilt! I think my favorite is WASHED WOOD RED, though I like all of them. I think this must be one of my favorite quilt block patterns. I've only made pillows so far from it, but seriously need to make a whole quilt. My favorite fabric is the wonderful yellow word stripe you used in the border. I like the yellow and gray combo the best. Great quilt! Thanks for sharing the giveaway too! I really love Tiny Words in Red. Your quilt is beautiful, and the border is pure genius! I see your quilt inspector agrees. I love the Disappearing Hourglass fabric. Love the quilt! Beautiful quilt! My favorite print is the blue background with white writing. You quilt is beautiful! I like Daisy Grey fabric! I love your quilt. My favorite fabric has to be the stripe, I love how it made the border look like piano keys. I like all of them but the Washed Wood Turquoise is great. I LOVE the Happy Medallion in yellow fabric! Tiny words Turquoise is my fave! Such beautiful fabrics! I really like Keys in turquoise, and the Joy panel. Gorgeous quilt! I will have to make that pattern some time. Not eligible for the giveaway, so I'm glad I don't have to pick a favourite of those lovely fabrics! I love all of the words, but if I have to pick one... Happiness panel in grey multi. Thanks for the chance. Your quilt is beautiful!! I love the colors in in and may have to make another one. I made one with just teal and white, and though I love it, I like the use of colors also. I love the happiness panel, but they are all nice. LOVE those panels-anyone would! I really like the words with the red background. Would love to win a bundle. Thanks for the opportunity. Words AND stripes in the same fabric? Winner!! Oh my, Mary, you really outdid yourself on this...I love it! Saying it is calming is a perfect way to describe this fabric. I felt the same way! 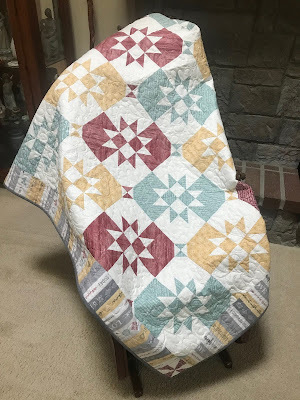 Love the quilt you made and quilted with this gorgeous fabric Mary. The disappearing hour glass is a great block. 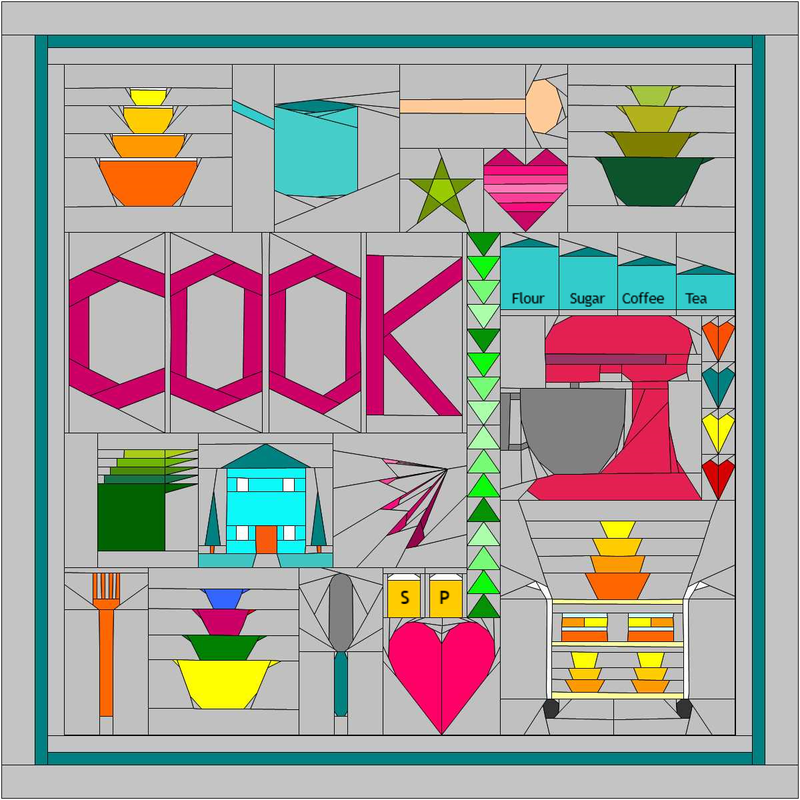 Must check it out....thanks. I agree with your dog - your quilt is lovely! Thanks for sharing this! My favorite print is the Tiny Words in gray. I love anything texty! 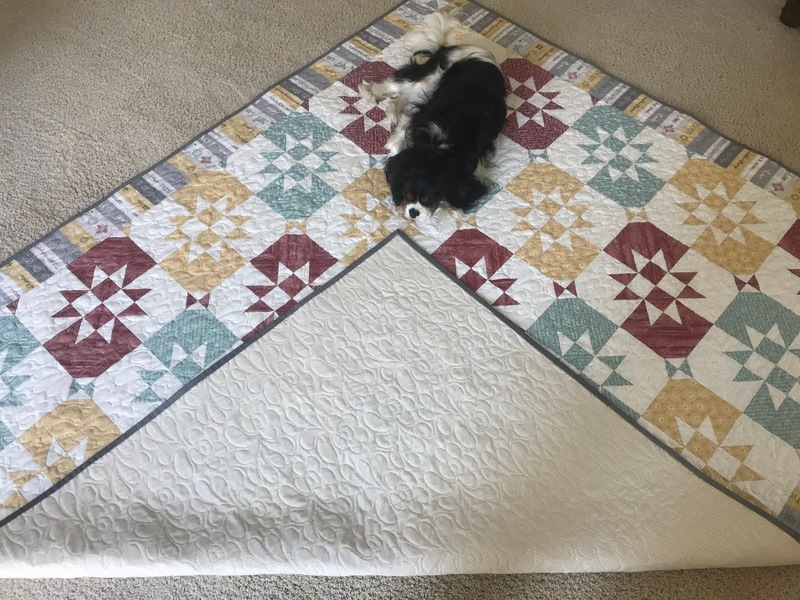 Mary, your quilt is beautiful and your inspector is adorable! I’m so happy for Cherry and have always loved Benartex fabrics. I would love to use the panel with the pattern you used in this lovely quilt. Cute pup. Your quilt is lovely, a perfect pattern for the fabrics. My favorite is the joy panel. Oh, Mary, you picked the perfect design to show all the fabrics. You hit it out of the park. I love the key patterned fabric. Lots of words to live by in the line for sure. I love the text print in Turqouise. thank you! Your quilt looks great! You did a beautiful job with the fabrics! BRAVO, Mary! Your quilt is gorgeous. I love the colors, especially the turquoise. All of the turquoise designs in this line are my favorite ;) Actually, I love all the muted colors in these fabrics. You have an adorable quilt inspector. It looks amazing! 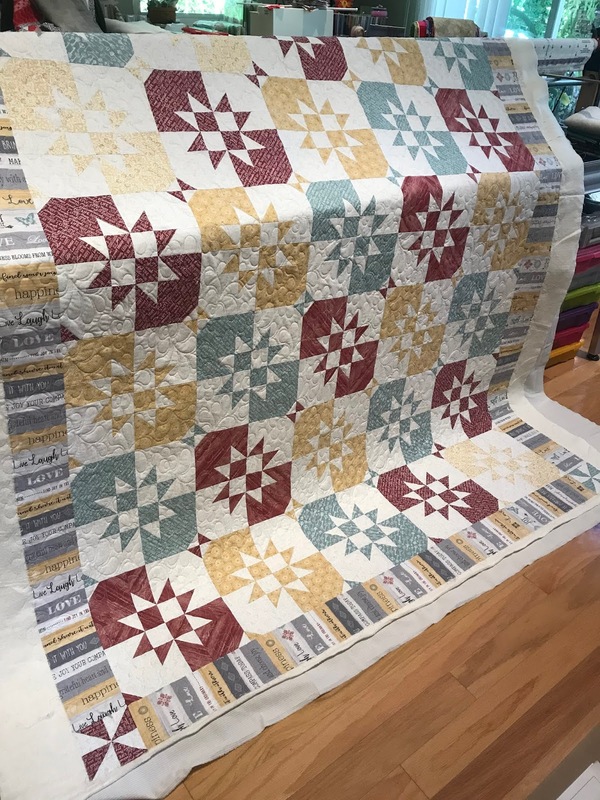 The quilt blocks and the fabric selection are a perfect fit! Well done! 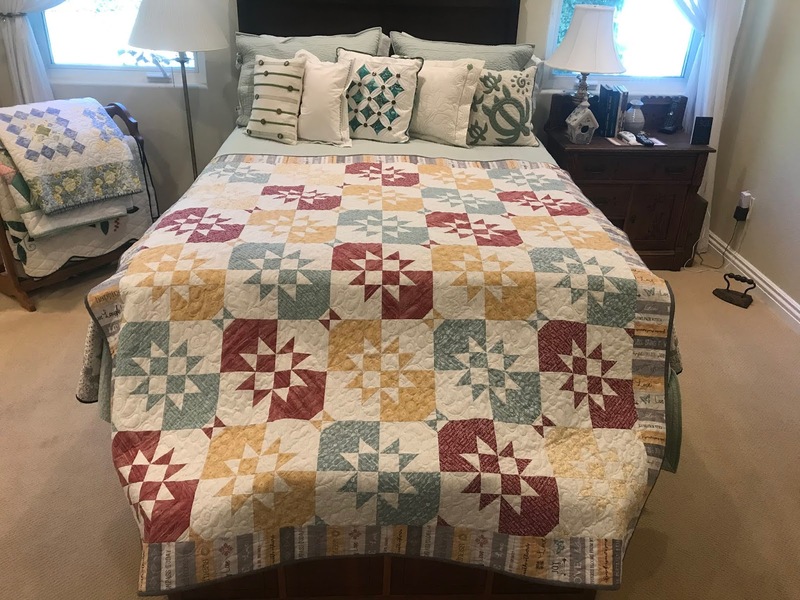 Absolutely beautiful quilt to showcase these lovely fabrics ! I've been on a binge with grey and turquoise lately, so Word Stripe in Grey/Turquoise is probably my favorite. Tiny Words in grey is also fun (so is the red :-) ). Hard to pick one favorite! I like how the three main colors in your quilt center are set diagonally.